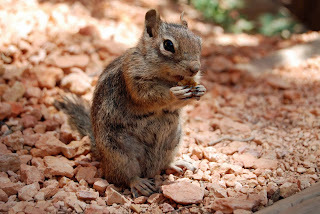 I don't think I've ever visited a place in the U.S. where I didn't see chipmunks (I found the little guy above in Bryce Canyon Utah). That's probably because there are 25 species of chipmunks and only one of those species is found outside of North America (the Siberian chipmunk, but it's not just found in Siberia...) Unlike their grey squirrel cousins, chipmunks are ground-dwelling squirrels that live in burrows. We're not seeing many chipmunks this time of year, but come spring they'll be active again, collecting food and getting ready for mating season in late spring and fall. They're omnivores and "crepuscular," which means they're most active at dusk and dawn. Want to learn more about chipmunks? Check out this earlier post! I love this meat-free Friday recipe, because it's easy and tasty! It comes from one of my favorite cookbooks, A Beautiful Bowl of Soup by Paulette Mitchell. If you don't have this cookbook yet, it's time to make an order. Combine and heat the vegetable stock, soy sauce, and pepper. Bring to a boil. Add the noodles, spinach, corn, and green onions. Cook until spinach is wilted and noodles are tender. Serve in bowls. First put the noodles in the bowls and then add liquid. read greenmomster's previous post on pangolins! We greenmomsters love pangolins! We've posted about them several times (check out these posts to learn about pangolin conservation and how you can help). Today is World Pangolin Day and the folks at Peppermint Narwhal have put together this informative graphic on these fascinating mammals. Enjoy! Meat-Free Friday -- Cauliflower and Cheese soup! Are you trying meatless meals for Lent? Here's a great website from Oxfam that allows you to really maximize your positive impact on the environment and farmers: Eat4Good! This recipe's a perfect soup for cold, snowy, rainy February -- cheesy, warm and filling! 2. Add 5 cups vegetable broth and bring to boiling. Lower the heat, add the cauliflower, and cook until cauliflower is tender. 3. Whisk together 1 cup vegetable broth and flour. Add to saucepan. 4. Stir in remaining ingredients and cook until cheese is melted. Recipe makes just enough for our family of 5, served with bread and two vegetable sides. It's my birthday today, so I'm reposting from back in 2013 -- enjoy! Abraham Lincoln, Charles Darwin, and I all have something in common (and it’s not our smashing fashion sense) – February 12th is our birthday! The President who held the U.S. together and freed the enslaved people, the writer of On the Origin of Species, and me! What do the three of us have in common, other than a birthday? Although I feel pretty certain I’ll never have the worldwide impact of my two birthday-mates, I can say that we share one trait – passion about the world around us. We all have the gift of having something (or many things) that make us feel alive and anxious to get our days started. Today, I’m going to spend my day teaching an ecology class at the local community college. OK, it’s not preserving the Union, but I get to spend the morning talking to students about the beauty and wonder of the natural world; I’ll spend the afternoon outside helping them work through a lab on plant distribution. I’ll be in the company of students who still find nature fascinating and might even want to make environmental science or ecology their career choice. In the evening, I’ll be going to the church’s shrove Tuesday pancake supper with my family, my other passion. What a great way to spend a birthday! So happy birthday to Lincoln, Darwin, and the greenmomster! Here’s to a life blessed with passion and wonder! I'm standing in front of a classroom of students, talking about the environmental benefits of organic agriculture or electric cars or fuel-efficient cars or vegetarian diets or recycling or even turning down the thermostat a few degrees, and the usual refrain begins -- "We can't do that!" "It costs too much money! "It won't work at my house" and my favorite, just because it's honest, "I don't want to!" The students think I'm going to back down, but I'm thinking, "Now the fun begins!" The conversation now gets realistic. I explain that the goal isn't to green everything. It's about taking a good, hard look at your lifestyle and figuring out which sustainable changes will work. Start with the low-hanging fruit. We can all bring reusable bags to the grocery store, recycle glass, paper and aluminum, drive a little less. No problem. Then choose one activity that's a little heavier lift, but still sustainable. Can you eat one meat-free day per week? Can you commute via carpool or public transit? Can you purchase a hybrid or electric car? Would you consider adopting a child when increasing your family size? It's interesting to hear the changes students can and can't make as they try to reduce their environmental footprint. That's why I really enjoyed Elizabeth Leamy's recent article, "How to be green without giving up life's luxuries." She explains the pros and cons of various lifestyle changes and leaves it to the reader to decide what's doable long-term. Check it out and post here about changes you've decided to make! Mammal Monday -- 10 fun polar bear facts! I watched a few political talk shows yesterday, listening as the Republican pundits encouraged us to pay attention to the administration's accomplishments. I agree completely! One of this administration's "accomplishments" is the opening of public lands to oil and gas exploration via "streamlining" of permitting processes, including the reduction of time that the U.S. taxpayers have to comment on finalized leases. Another accomplishment is the opening of the Arctic National Wildlife Refuge to oil and gas drilling to pay for the tax reform. And we should definitely remember the accomplishment of pulling the U.S. out of the Paris Climate accords. For today's Mammal Monday, let's take a look at a repost about a species that will be affected by the current administration's accomplishments -- the polar bear! Polar bears feed primarily on ringed seals (U.S. FWS 2009). Polar bears can live from 25 to 30 years in the wild. To live in the harsh arctic climate, they have evolved several different adaptations to stay warm – they’ve got a thick layer of blubber and are covered in a thick layer of insulating fur. 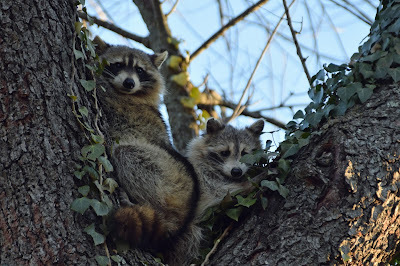 Although the fur is white (providing camouflage in their white, icy environment), the skin underneath is actually black, allowing it to absorb the sun’s rays. Even the soles of the polar bear’s feet are covered in fur (National Geographic ND). At around 3-5 years of age, polar bears are ready to reproduce (U.S. FWS 2009). Females dig dens in the arctic ice and give birth during the winter, usually to twins. Polar bear cubs stay with their mothers for over two years, in order to learn survival skills. All parental care is given by the female; in fact, the females must protect the young from the males who have been known to kill the cubs (National Geographic ND). The polar bear population is currently estimated at 20,000-25,000 (U.S. FWS 2009). Polar bears are listed under the Endangered Species Act as threatened (U.S. FWS 2013) and listed on Appendix II of CITES, with primary threats to the population being the loss of sea ice, due to climate change. Several international agreements are in place to try to protect the polar bear and its habitat. Canada is the only nation with polar bears that currently allows sports hunting of this species (Washington Post 2013). Eilperin, J.. 2013. “U.S. Proposal to Protect Polar Bears Fails.” Washington Post, March 8, 2013. It's the world's easiest meat-free Friday recipe! Seasonal veggies -- check! Eggs -- check! A dinner that everyone loves -- check! any wintertime veggies you have -- I like to mix sweet potatoes, brussel sprouts, and cauliflower, but you can use turnips, white potatoes, cabbage, etc. Chop the veggies into bite-sized pieces. Mix with a generous amount of olive oil (the veggies should be a little shiny), and add red pepper, salt, and pepper to taste. Meanwhile, fry up the eggs -- some folks like them over-easy, some folks like them sunny side up. Top the veggies with the eggs and serve with bread and a salad. Enjoy!